The 18-hole Championship at Hollybrook Golf & Tennis Club in Pembroke Pines, FL is a private golf course that opened in 1968. Championship at Hollybrook Golf & Tennis Club measures 6590 yards from the longest tees and has a slope rating of 131 and a 72. 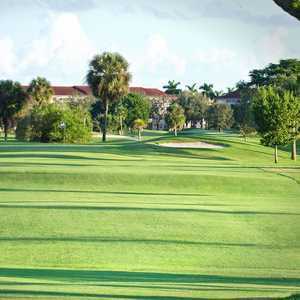 Flamingo Lakes Golf & Country Club in Pembroke Pines is a Broward County favorite. The par-71 course is challenging but at the same time player friendly enough to appeal to a range of skill levels. The course has a hilly terrain, a unique feature for Florida golf courses, that provide a variety of different lies. Situated just minutes from south Florida's scenic beaches, the 27 championship holes at Grand Palms seamlessly incorporate the area's natural features into the design. The Grand/Royal golf course is the longest and most challenging of the Grand Palms' courses. 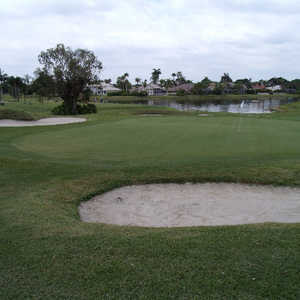 The 18-hole Par-3 at Hollybrook Golf & Tennis Club in Pembroke Pines, FL is a private golf course that opened in 1968. Par-3 at Hollybrook Golf & Tennis Club measures 1599 yards from the longest tees. The greens are bermuda grass. 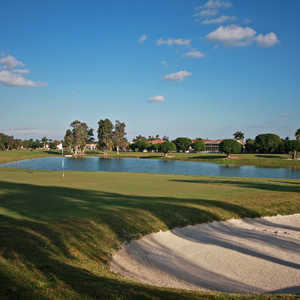 The 18-hole Pembroke Lakes Golf & Racquet Club in Pembroke Pines, FL is a public golf course that opened in 1974. Designed by Howard & John Watson, Pembroke Lakes Golf & Racquet Club measures 6815 yards from the longest tees and has a slope rating of 140 and a 73. Grand Palms offers three nines: Royal, Sabal, and Grand, which are played in three different 18-hole combinations. The golf courses sprawl across a landscape of tropical foliage and swaying palms, showcasing the best of what south Florida golf has to offer. Grand Palms is home to 27 holes of golf that showcase all of the beauty south Florida has to offer. Three nines are played in three different 18-hole combinations, all of which share a colorful landscape of tropical foliage and swaying palm trees. The Grand/Sabal combination combines the longest and shortest nines.